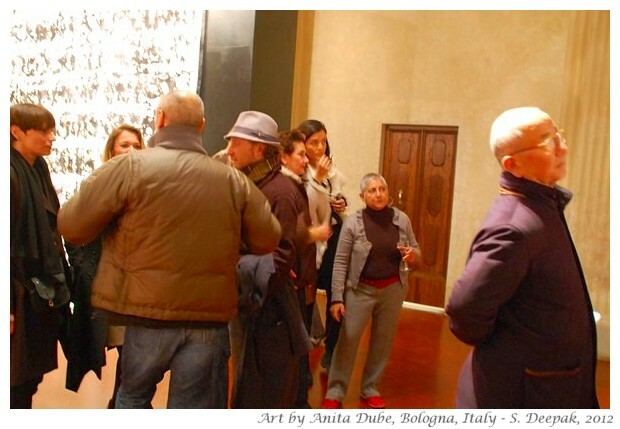 The well known Indian artist, Anita Dube has come to Bologna (Italy) for the annual art fair that brings together known and emerging artists from different parts of the world as well as art collectors. During the three days of the art fair organised at the trade fair grounds, the different art galleries of the city host exhibitions of well known names. At the same time old city centre has some important art installations in public spaces. I love this period of the year for the opportunities it offers to experience different art expressions and to meet some of the well known artists from around the world. The art fair is followed by another wonderful event called "Art and science", that is another wonderful opportunity to see different inter-faces between art and science. This year, the "Art and Science" event has two of my photographs in an exhibition called "Visi diversi intorno a te" (Different faces around you) about immigrant communities living in Bologna. 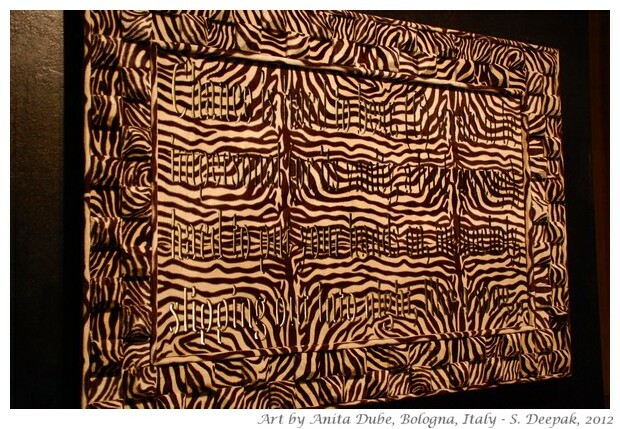 Marabini Gallery is delighted to announce the ﬁrst Italian solo exhibition of the Indian artist Anita Dube. The opening will take place on Friday, January 27th from 6pm to 8pm.The artist will be present. 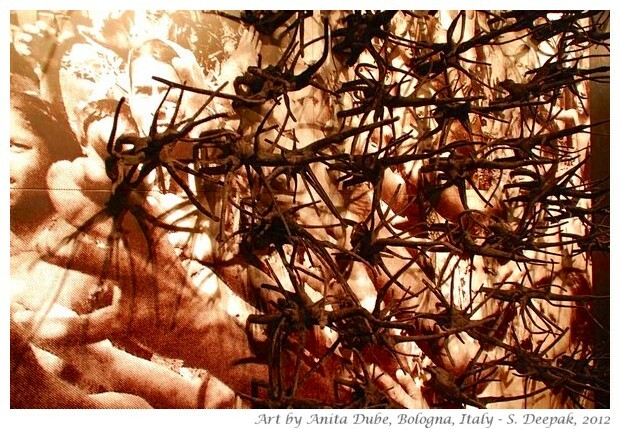 Anita Dube creates her works through a conceptual language that valorizes sculptural works mainly focused on issues such as social and personal memory, history, mythology and the phenomenological experience. 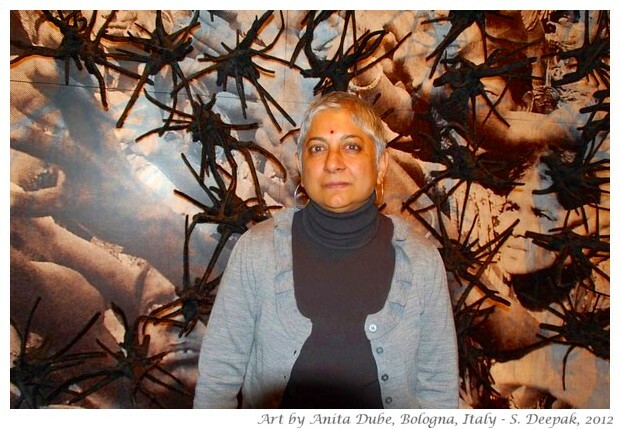 Anita Dube came to the sculptural practice through her involvement with the Association of Indian Radical Painter and Sculptors, a group formed in the eighties in Baroda whose style is characterized by a strong awareness of social and political criticism contrasted with the kind more narrative of the traditional school. This sort of challenge to the cultural and socio-political themes remain constant in Dube's work often focused on the anxiety of human being against the personal and society's processes of loss and regeneration. Anita often uses in her work a wide variety of objects drawn from the industry( foam, plastic, cables), manufacturing (velvet, wire, beads), biological (teeth and bones) and readymade ( famous ceramics eyes that you can ﬁnd in typical Hindu statues). She often juxtaposes organic and inorganic materials with handmade objects and craft to create a sense of contrast between familiar and strange, inviting and unsettling. For example in the works in this exhibition often takes the concept of “skin” covering objects such as tree roots on which it is applied a coating of dark velvet Void ( Coitus), 2008. Through fabrics and embroidery Anita takes the gestures and chores that have been traditionally assigned to women for centuries. To woman is also dedicated a large candle Woman, 2007 that makes up the letters of the word “woman” which gives a sense of the sacred feminine ﬁgure and makes it almost a universal concept. 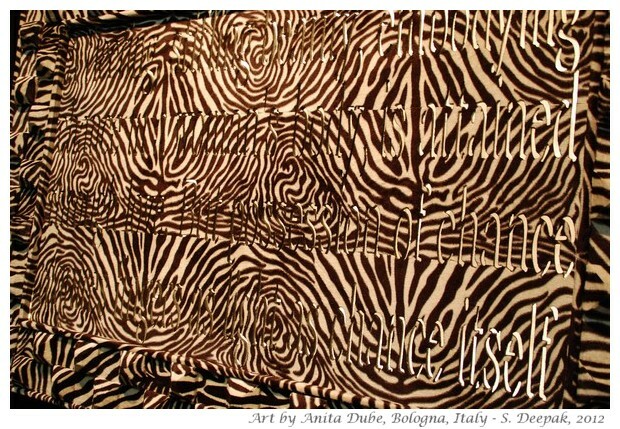 In other works for example Chanche Piece A-B, 2008 the artist uses a zebra fabric that covers a hypothetical canvas and wooden frame on which are carved phrases and words that are lit from the back. The use of the words is essential in Dube's work and especially for the exhibition at the Marabini Gallery, also takes quotes from iconic Italian author Pasolini in her work, paying a tribute to Italy. Her work Aah (a Sigh, 2008) has an incredible impact in which, from a black and white photograph printed on a large canvas, velvet-covered branches emerge as extensions of the hands of hungry people of food and hope. The strength and hardness of the contents of the works are diluted and made less aggressive by a purity and aesthetics form that make each work a piece of extreme elegance and reﬁned beauty. 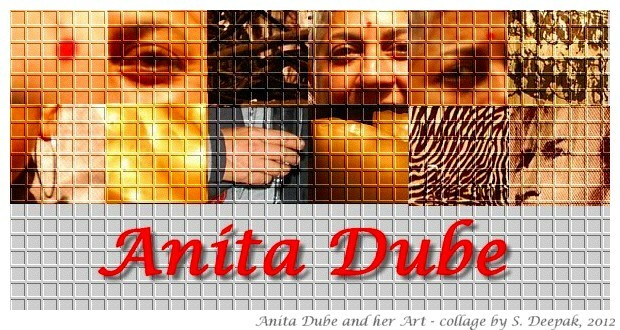 Anita Dube was born in Lucknow (India) in 1958, and she lives and works in New Delhi. Began her career as an art critic and then devote herself increasingly to the profession of artist. International artist, has had solo exhibitions in New York, in India and in Paris: "Illegal" ,Nature Morte, New Delhi and Bose Pacia, New York (2005), “ Phantomos of Liberty” Gallerie Almine Rech, Parigi (2007). Among the most important collective participation: "Seventh Havana Biennial"- Havana, Cuba (2000), “Resonance: Anita Dube and Subodh Gupta”, Vancouver International Center for Contemporary Asian Art, Vancouver (2004), “Urban Manners: 15 Contemporary Artists from India”, Hangar Bicocca, Milano (2007), Paris-Delhi-Bombay” , Centre Pompidou, Paris(2011). Sunil: Hello Anita, can you tell briefly about yourself? Anita: There is not much to say, I am originally from Lucknow ..
Sunil: .. and what brought you from Lucknow to Delhi? Anita: A desire to be out and independent .. out of the boundaries of family .. so I came to Delhi and did BA in history, but I was not so happy with it and then I did MA in history of art from Baroda. After that slowly .. I used to write about art and gradually I started working as an artist. So I am not professionally trained as an artist and I started on my own. Sunil: Let us talk about your works in this exhibition. There is a sculpture on woman and there are others where the words are about women .. so what do you wish to express about women in your art? Anita: I want to express my experience as a woman .. a kind of slow burning that you feel inside as a woman .. especially in India and especially in U.P. Women have these feelings inside them that are beautiful but that are also burning, melting, a kind of anguish, experiences of life .. I wanted to express those. I wanted to express those feelings and in this piece, I found wax to be that material that can express those feelings. This sculpture is made of wax with wicks that are burning and as they burn, the shape keeps on changing slowly ..
Sunil: That is a beautiful way to explain it. What about this piece here with those abstract black shapes and patterns on it? Anita: Here I took three pieces of text and wrote them one over the another. I worked on a white velvet sheet spread on the ground, writing with ink and this is the final result. Sunil: The hidden text on the sheet that we can't read, does that mean some thing? Anita: It is like digestion .. when we prepare food, everything is separate and it looks good and then in the body, it all combines and gets assimilated .. I wanted to express something like that, it is similar. If you want new meanings from text, you need to digest it and assimilate it .. otherwise, the words are of someone else and separate from you .. it is about abstraction and mixing up of things. Sunil: It has a strong emotional impact. .. Can we talk about this work with the roots that is probably among the more famous of your works? Anita: Perhaps because it is a different kind of work. It has the word "Aah" written on it with those roots. Once I was going to Gurgaon and on the roadside I saw a man selling these roots, he had five of them. I bought all of them and then cast them in fibre-glass and got them covered with black velvet, and then from them I made the word "Aah" on the background a newspaper cutting .. so they are reaching out from the desperate persons ..
Sunil: You are using lot of velvet in your works. 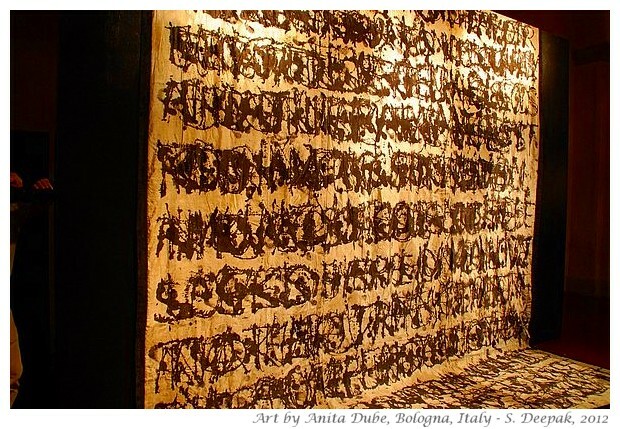 Even those other two works displayed near the entrance are covered with velvet and then words were written on them ..
Anita: Yes, I like the feel of this material, the smoothness .. it is wonderful, and it has a shine. I love the feeling of this material. Sunil: Thanks Anita for this chat. Best of luck for your exhibition. Finally I want to add a few words on my impression of Anita's work. I think that art has to provoke and stimulate us to look at the world from different eyes. In this sense, the works of Anita are very forceful. I am intrigued by the way she weaves words in her art, not so much when she uses the words "normally", but when she uses them to express feelings in an abstract way. Ancient humanity has considered words to have magic powers. Hinduism believes in power of "Om" and those of mantras. Bible says that first there was nothing and then God said the words and the world came into being. Koran with "Kun faaya kun" gives the same message. 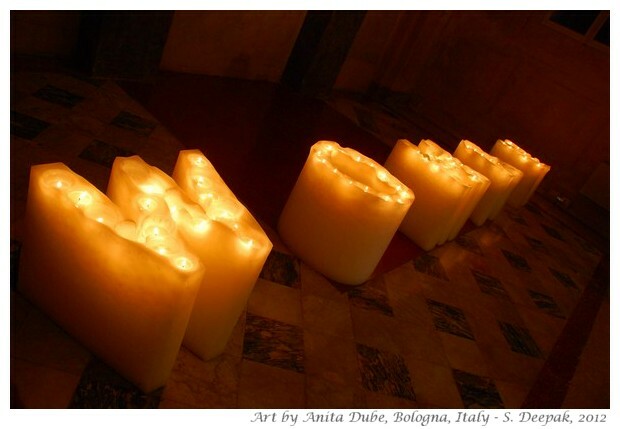 It is that magical powers of the words that some of Anita's work expresses. I enjoyed her exhibition and I hope I can back after a few days, to look at it in relative solitude.